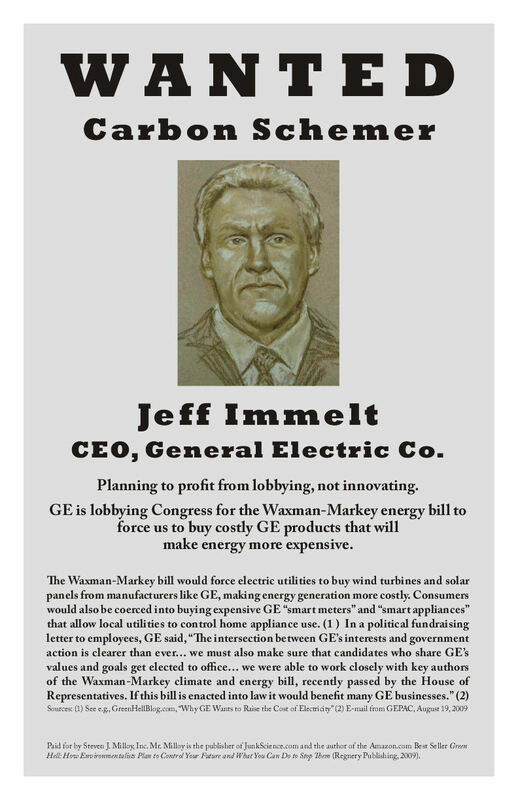 Everyday seems to bring new revelations about federal stimulus money earmarked for the Obama-blessed General Electric. Yesterday it was smart meters, today’s scheme involves water heaters. …lets utilities regulate the use by sending signals wirelessly to them from smart meters. Additionally, the smart appliance qualifies for Energy Star rebate programs… In July, the U.S. Department of Energy announced the availability of nearly $300 million in funding for state-run Energy Star rebate programs as part of the American Recovery and Reinvestment Act stimulus plan. The Obama-Immelt Pact (rentseeking-for-lobbying) is corrupt enough but it’s made positively execrable by its ends — allowing the government (through regulated utilities) to control our water heaters. This entry was posted on	October 2, 2009 at 11:39 am	and is filed under Capitalism Against Capitalism, First Green President. Just brilliant. We paid taxes so they could regulate us to death. Why does there seem to be no regulation on lobbyists? J.P. Morgan pulled the plug on Nicola Tesla lab in Long Island NY in 1915, just as he was developing his free energy and wireless energy transmission devices. He also got George Westinghouse to talk Tesla out of his patient royals that he was getting from the Westinghouse Company, thus cutting off a source of money for Tesla. Then Morgan went and drove George Westinghouse out of his own company. A great series of books that people need to read are by Antony Sutton, Wall Street and the Rise of the Bolsheviks, Wall Street and the Rise of FDR, and Wall Street and the Rise of the Nazis. All of these books can be read on the net so you don’t have to buy them. Antony Sutton spells out real good what the bankers and companys like GE have done over the years. GE doesn’t believe in America. It only believes in profit at any cost. Global warming is not real. We are really headed into a Ice Age and we and the world are not going to be prepared for it. Our local power district, a PUBLIC power district (state political subdivision), installed electric meters with TCP/IP addresses in them last year. They read the meters over a signal that travels over the power lateral or drop to your house from whence it goes to fiber optic in the utility easement. This water heater crap, as all appliances, will only work individually, if you have an electric water heater with a TCP/IP address on it too (or you let them put a similarly addressed gas valve on your water heater). Most people here heat their water and houses with gas, again provided by a PUBLIC utility (state political subdivision). The boards of each of these are elected by voters and we consider anything beyond central reading of our power meters to be a gross invasion of our privacy. More and more pressure is being put on our state legislature to start passing acts forbidding “Obamaland” in this state. And remember, the Constitution is still in effect. Obama is just ignoring it. And state governments are sovreign to the Federal Government according to the Legal Republic. Per Gerald Celente, American Revolution II has started, the most recent act of which was the invasion of Washington, DC by 1.5 – 2 Million “ordinary” citizens on 12 SEP, not covered, of course, by the corporatist, fascist media. It may look black now, but the times will change. It may not be pretty, but the times will change.